According to Tokyo Kantei, the average asking price of a 70 sqm (753 sq.ft) second-hand apartment across greater Tokyo was 36,230,000 Yen in June, down 0.2% from the previous month but up 1.7% from last year. The average building age was 23.9 years. June is typically a slow month for real estate in Japan as the peak spring sales season has ended. Typically it is common to see sellers take unsold listings temporarily off the market at this time. However, this year has not seen a drop in listings with Tokyo Kantei suggesting that sellers are staying active in preparation for next year’s consumption tax increase. In Tokyo’s 23 wards the average asking price was 53,830,000 Yen, up 0.1% from the previous month and up 1.4% from last year. The average building age was 23.8 years. 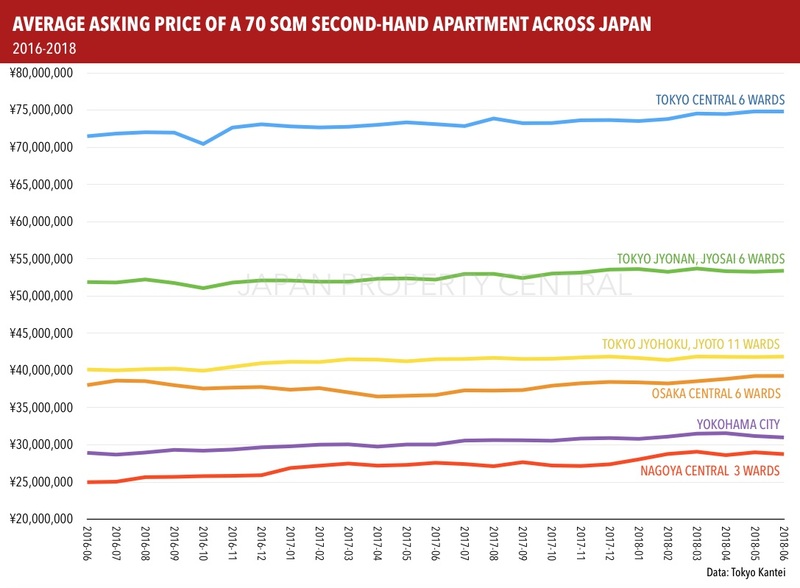 In central Tokyo’s six wards (Chiyoda, Chuo, Minato, Shinjuku, Bunkyo and Shibuya) the average asking price was 74,820,000 Yen, down 0.01% from the previous month but up 2.3% from last year. The average building age was 22.3 years. Source: Tokyo Kantei, July 23, 2018.